Playing cards game is the most famous and widely played game. There are different types of playing cards game ranging from poker to cards matching game. Playing cards are produced for all age groups. Some of the playing card games are produced for kids with age range from 5 to 10 and some are produced for adults with age range from 16 to 30 and some are produced for old age audience. These are Packaged in Playing card boxes with custom and attractive printing for quick selling! Some of the famous playing card games for adults are Poker, Bridge, Gin Rummy and Blackjack. Most of these games are family games and are enjoyed by lots of family gatherings and the excitement can be increased in these games by betting on the game. famous playing card games for kids are Snip Snap, Go Fish, Rummy and animal matching game with animal pictures on it. Playing card games for kids range from very starting level to competitive level and that depends on the age group. Playing card packaging is done most of the times in RTE boxes those have tuck flaps at top and bottom. Usually in any cards game, there are about 30 to 54 cards. So the box is designed accordingly so that it can handle that many cards easily. These cards are called decks and the number of cards in each deck varies and depends on the card producer but the standard is 54 cards per deck. The normal thickness of one deck is about 0.95″ so the Playing Card Box that will hold these card should be 1″ thick. The standard size of any card game is about 3.25″x2.125″ so the width and height of the playing card box should be about 3.5″x2.5″. There are other sizes available as well but its the standard size that is used for different card games like Bridge or Poker. Playing card boxes should be good looking and should be fully decorated to grab the eyes of the potential clients. These boxes are very important as these boxes are the face of the game and should be designed and decorated very carefully. Kids card game boxes should be designed and printed with cartoon characters on it while the boxes for adult card games should be designed with images of the game along with some sort of foiling decoration to make these attractive. These boxes should be re-usable as these will be used by game owner again & again. Playing card boxes have different styles like RTE, STE, two piece and tray & sleeve style. Most common and least expensive is RTE & STE boxes. Two piece boxes comes in both folding style and pre-assembled style but the later one is more expensive than other. Card game boxes also comes in tray & sleeve style but again, this style packaging is more expensive than the first one. 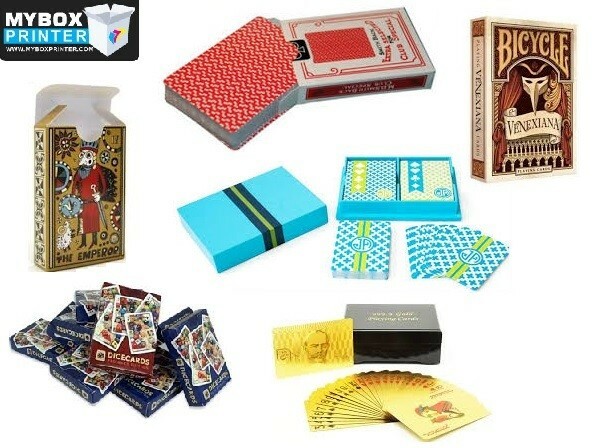 Custom Playing card packaging is the game changer in card games market and the one that takes the lead in proper designing & printing of these packaging are way ahead than others. ← Custom Tea Packaging – Way to Sell Tea Bags Effectively!